I would have to say that March has come in like a lion this year. After all the nice weather we had just a short while ago, the last few days have been cold and colder. We even had a dusting of snow last night. Today was in the teens with winds that froze your face in short order. Tomorrow is not going to be much better. I think the forecast is for better weather to come in next week again. But it’s been too cold to go out and play with it. I hope the forecast holds, because I think Lambeau is going to like this thing. He loves to play fetch and run, and this will give him plenty of both. 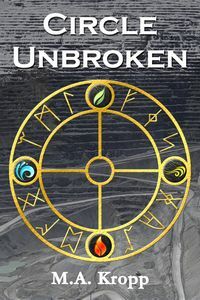 The second story in the urban fantasy series (no, it doesn’t have a title yet) is out to readers now. I started playing with a cover idea, and wrote up a quick blurb that will need some work. So that’s moving along nicely. I plan to use this coming week to work on short stories for the sci-fi anthology I’m looking at getting out either late this year or early next. Then it will be revisions on the urban fantasy, depending on what the readers have to say. So things are moving along, if not at speed, at least fairly steadily. I also started playing around with some design ideas for business cards and larger promotional cards. I’ve wanted something for a while, because people will ask but I’m sure by the time they get to a computer, they’ve forgotten where to look and what to look for to see my books. So, I thought having some cards might help. And I can take the larger ones to events and such. I’ve also been keeping up with reading, so far. I get a bit in every evening before dinner, and a bit more before bed, usually on two different books. I have eight done so far, and that’s pretty good for me, since I am not a really fast reader. But it does mean I have a couple backlogged for the Friday Review posts. Which is nice. Now, if I could get the reviews written and ready to go, that would really be great. I’m working on that part. I ordered my seeds for starting this week. Much less than in past years, but we only have the deck, and plant stand in the basement to work with now. I ordered two tomatoes, cucumbers, and some lettuces. And we are going to put herbs in the AeroGrow units for the summer, and then tomatoes and cucumbers over the winter. I will also put basil on the deck in addition to what will be in the AeroGrow gardens, because you really can’t have too much basil, especially if you are fond of pesto. And we are quite fond of pesto. And that’s about all there is for this week. Let’s hope the weather warms up again, right?